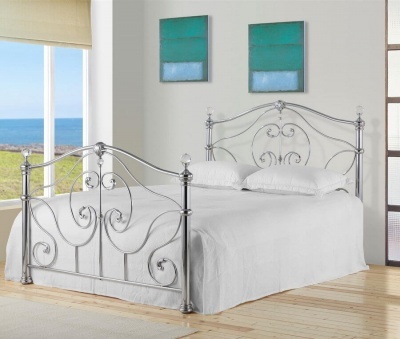 Attractive king-size bed frame with alluring detail. Crystal effect finials and chrome make this a perfect fit for luxury bedrooms. Durable powder coated finish in stone white. Similar colour to magnolia paint. Flat packed for easy self assembly. Full instructions included. The only tool you will need is a cross head screwdriver. No need to struggle, the Sophie bed frame is delivered by a two man team to a room of your choice.